Bristol Show 2018: the best new turntables | What Hi-Fi? Brand-new turntables from long-established brands, brand-new decks from first-timers... the turntable revolution shows no sign of flagging at the Bristol Show. 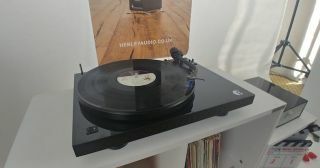 Doesn't matter if you're an LP newbie, whether you want to spend peanuts or break the bank - the Bristol Show has the turntable to suit your needs. In terms of the more obvious brands, market-leader Pro-Ject is attempting to move the game on with its Debut III S Audiophile, while the equally venerable Rega has whipped the covers off its first phono stage-equipped deck, the P1 Plus. Of the brands that really should be competing with Pro-Ject and Rega but aren't, Dual has unveiled the latest version of its storied CS-505 belt-drive deck - the Dual brand has been subject to quite a few indignities of late, but this is a German-made product delivered by the company that first owned the brand-name. And, of course, it wouldn't be a Bristol Show without some aspirational turntables on display. Gold Note has introduced its Mediterraneo turntable (at £6000, it's less expensive than the cartridge the company recommends for it), and Mark Levinson has its very first record player, the £10k No. 505. Also occupying the high-end high ground (rather to our disappointment, it's true) is Technics - its new SP-10R is a) on sale in June and b) likely to cost around £8k. Gulp. Find out a little more about these intriguing new products in the video above.